This pontoon bridge has been damaged by US planes this morning. Before the barrage, it will support the first vehicle over (other than a jeep), but cracking strains are heard. After that, the next vehicle (other than a jeep) over has a chance of ruining the bridge. Use Bridge Strength table below for vehicle passing until the barrage starts. After that, use bridge Rep Rating in Barrage Rules. Bridge Engagement starts with attack on the 3 German squads guarding the bridge. These guards will defend until 50% of their forces are OOF or run-away, then they will check morale individually. (Note: this is KH specific and not part of the NUTS! rules.) Those Germans surviving that morale check will check once again at 75%, then they retreat to the others side of the hill. A barrage on the pontoon bridge will come down in 1d6+1 turns after they retreat. The German Infantry will try to block the pontoon bridge. This is to represent an active artillery barrage on an area. In this case, it’ll be used as motivation to get Kelly and Oddballs tanks across the river if they haven’t already. 1) Start Barrage: Roll activation dice every turn, then do your moves. There will be no Germans left in the area unless they are OOF, so they have no move. 3) The pontoon bridge is divided into 4 segments and has REP 4 and each hit in that segment lowers REP by 1. 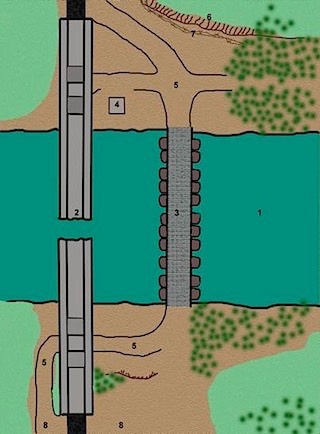 Roll 2d6 vs the Rep+1 of each figure, vehicle and the bridge on the board, at the start of the barrage. Figures in cover or open topped AFV’s add another +1 to Rep.
* The casualty is knocked down and must take “Recover from Knock Down” test at -1 Rep due to seriousness of artillery frags. * In addition, each vehicle on the table is subject to a KH Hands of Fate attack, a variation of NUTS! 2nd Edition page 49. On a roll of “2”, any vehicle with a top AR of less than 2 is destroyed, while those with an AR of 2 or higher is disabled. Whether Kelly’s troops are on foot or vehicle, they are fighting to get across a bridge with any of Oddball’s tanks and (per Kelly) without the Support Units. Any Support Units (Oddball’s Army) that make it across with Kelly’s crew will wait for orders from the respective commanders before leaving for Clermont. This river can’t be forded as it is more than 4 feet (real world) deep. For passing of time, KH Hours are an arbitrary 20 turns long. If ally troops are there longer than an hour (which includes the first barrage), a counter-attack of a German platoon ensues. You may skip this counter-attack if you wish to get on with Clermont. The German counter-attack comes from the ridge at Point 6 on the map. If the bridge is repaired in 5 hours (new rules below), Oddball’s Army may go to Clermont. If there is a stalemate at the bank, the remnants of Oddball’s Army can turn the tide. If Kelly lost, then Oddball’s Army can have a crack at it. If you played “Hilltop”, remember your salvage limitations. There is a chance that before this battle, the Heroes got supplies from Oddball’s Army. Roll 1d6 vs Kelly’s Rep-2. If successful, you are replenished. If not, you continue your limitations.